The life of Rock Hudson falls into clear, distinct phases. It starts with a childhood so full of poverty and familial dysfunction that it could have been lifted from (or given inspiration to) a novel by Charles Dickens. From there, Hudson becomes a screen legend whose reign as King of Hollywood seems first secure, but starts a long, steady course downward as he is displaced by changing public tastes and a younger generation of stars. In the final phase of his life, Hudson is the wealthy center of a group of friends, business associates, and current and former lovers, whose in-fighting, intrigues, and stratagems surpass anything ever put on the air by Dynasty, the melodramatic prime-time soap opera in which Hudson had his last featured role. The essence of Hudson’s life is that it was always somehow larger than any of the films, plays, or television shows in which he starred. In this he shares much in common with his dear friend and contemporary, Elizabeth Taylor. Her multiple marriages and many affairs were splashed over the front pages of newspapers, magazines, and tabloids. Because Hudson was gay, and because this meant—during his lifetime—that his personal life needed to remain in the closet, much of his story was an open secret, written about only between the lines, or thinly concealed by romances with women that were never anything more than a publicist’s red herring. In his last year, the unavoidable revelation that he was dying of AIDS made Hudson a reluctant ambassador for both a disease and a sexuality that many Americans were still not quite ready to discuss. All that Heaven Allows borrows its title from what is today one of Hudson’s lesser-known films (though it was quite successful in 1955), and biographer Mark Griffin has taken on the difficult task of trying to posthumously reshape the way we see Hudson. Hudson’s stunning good looks and sexual magnetism made him a movie star of the greatest magnitude, but they also overshadowed his work as an actor (in this, too, he shares much in common with Elizabeth Taylor). In his final year, and in the years immediately following his death, the specter of AIDS threatened to blot out anything else for which he might be remembered. From a distance of over 30 years, Griffin is trying to take the screen idol off the altar, put the disease in its place, and give proper attention to Hudson’s acting talent, work ethic, and craft. Griffin is to be commended for his dedication to the task, and to the thoroughness of his research, which includes material from trade journals, studio records, film reviews, film histories, published memoirs, and many, many interviews with Hudson’s surviving friends and colleagues. However, Hudson made dozens of movies over the course of his career, and not all of them were on par with Giant or Pillow Talk. At times, Griffin seems to give even the most obscure of them the same attention he devotes to the most famous, sometimes justifying the effort by stating that such-and-such a film has garnered a cult following or is undergoing critical reevaluation. That may be true, but in attempting to reestablish the proper balance between the story of Hudson’s work and the story of Hudson’s life, Griffin may have erred too much on the side of the work. While some parts of Hudson’s life are given careful attention (most notably, his curious marriage to Phyllis Gates), other episodes are given short shrift, and some key players are not much more than shadow figures. This is especially true in the portrayal of Hudson’s mother, who is vividly drawn in the portion of the book devoted to Hudson’s childhood, but who then virtually disappears, except for occasional brief references to her intense—perhaps excessive—love for him, and his unquestioning devotion to her. But what forms did this love and devotion take? How did she feel about his burgeoning career? His marriage and divorce? What were her responses to the galaxy of agents, publicists, friends, and lovers who surrounded him? When and how did she try to steer his path? When did he heed, and when did he ignore her? If their story (as Griffin implies) should truly be summarized as, “Rock and Kay against the world,” some specifics would be nice. At its best, All That Heaven Allows is a rich and complex story of Hollywood’s biggest star in its most golden age. It’s the story of how a remarkable life and a remarkable talent merged in one man, and the story of how studios and publicists exerted so much control over both that nobody was ever quite sure what was real and what wasn’t. The truth of Hudson’s life—or at least some part of it—asserted itself at the end. 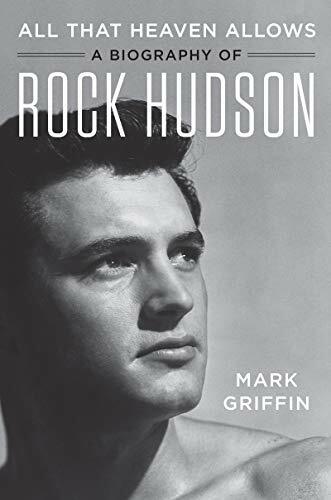 Mark Griffin’s biography helps balance the record to insure Rock Hudson is recognized as the talented actor he always was beneath the stardust.